If you have been fishing for a while, you know how disappointing it is to go for fishing and come back empty handed. On the other hand, you know the excitement that comes with getting a good catch. If you are a newbie in fishing, this is your chance to learn about fishing in order to avoid disappointments. To be successful at fishing, it is important to know the best fishing times. The best time of day to go fishing depends on many factors including where you are doing the fishing, types of fish in the waters, time season, tides, time of day, among other things. Various factors can guide you on the best time to consider going for fishing including the moon patterns, weather conditions, fish type, water sources among other factors. Are you fishing from a pond, river, lake or ocean? Are you fishing from the shoreline or from a boat? How deep are the waters from where you are fishing from? These factors will determine how successful your fishing expedition will be. Conduct a research on the type of water you are fishing from, what type of fish inhabits the water and you will be good to go. What fish species is your target? What is the size of the fish you are targeting? What fish species are in the waters where you are fishing from? Different fish species have different feeding patterns, habitats, and habits. Catfish, bass, trouts, mudfish, all require different strategies of fishing. It is important to do a research on the fish species in the waters where you are fishing. Tides play a big role in fishing. Tides are controlled by the moon. It is recommended to go for fishing during full moons and also during times when the moon is near the earth. Fish move and seek to feed when the tides rise or fall. This is the best time to fish. Google a tide chart in the area from where you are fishing. Plan to fish in shallow areas during high tides and to fish in muddy areas during low tides. Get a hold of a lunar calendar to guide you on the best fishing hours. Fish operate best during warm temperatures. The early morning and late evening sun works by warming the shallow waters, attracting the fish for feeding. When the temperatures are too hot, fish move into deeper waters to stay cool. Therefore fishing early in the morning or late in the afternoon is recommended. The temperatures are cooler and fish seek for meals in the shallow ends. If you need to fish during midday, when it is hot, then it is important to use deep fishing tricks. The hot temperatures cause decreased oxygen supply to the shallow waters, causing the fish to delve into deeper waters. Fish are cold-blooded animals. The best fishing time is when the weather is warm. Fish are very sluggish during the hot temperatures of summer. Also during winter, when the temperatures are very low, fish are quite inactive. Therefore, fishing will be slower when the temperatures are too cold or too hot. The temperatures will determine what kinds of baits and lures to use during fishing. During the cold weather, you need to give fish more time to be lured. On the other hand, you have to be very quick during the warm weather, because fish is very active during this season. Winds, storms, clouds, light rain and hard rain have an effect on your fishing success. It is important to study the wind pattern to know how to cast your bait. It is good to go fishing when it is windy. Also, it is best to fish during light rains but not recommended to fish during heavy rains. Cloudy days are good fishing times too. 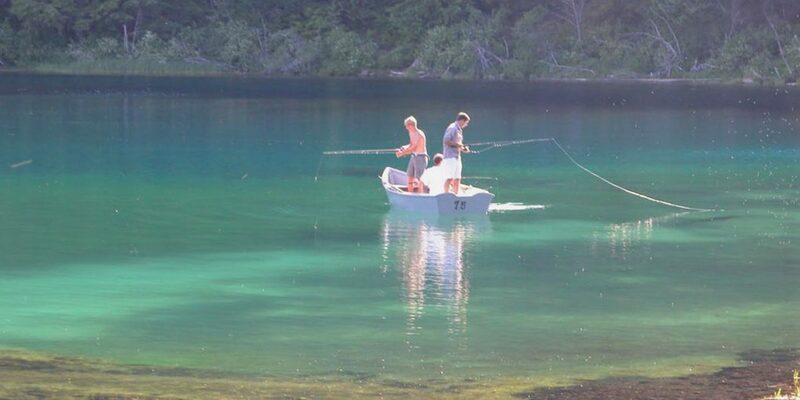 During spring, it is recommended to go fishing during the afternoon and early evening, because the water is warm. In the morning, the water is too cold and fish will rarely bite the bait. If you prefer fishing in the morning, then better wait for the season to change and water temperatures to warm up a bit. Fishing in the late morning and early afternoon can be challenging as the fish bite the baits on and off. If you must fish during this time, then aim for the downwind shoreline waters. The winds affect the food patterns in the water during this time of day by pushing the food into the downwind shoreline waters. Fishing is recommended during early mornings, before sunrise and early evening until sundown when it is dark. You need to be very tactical during this season because there is food in abundance in the waters and getting a fish to catch a bait can prove to be challenging. Fish move to deep waters to cool off during late morning and early afternoon, therefore it is not recommended to go fishing during this time of day. During fall, aim to fish during the afternoon and early evening when the sun is overhead. The water is warm at this time of day. Fishing during fall at this time is excellent because the fish are preparing for the winter season ahead by feeding a lot and they, therefore, stay in the shallow waters for long. Fishing during early morning to early afternoon is not advisable. During early morning the waters are too cold and during late morning to early afternoon, the waters are still not yet warm enough for the fish. They, therefore, bite baits on and off. Even professional fishermen have their days of being disappointed after following all the rules of fishing they know. Are you familiar with the biblical story of the disciples of Jesus who were professional fishermen? But there is this particular day they were very unlucky and did not catch any fish after trying to catch fish the whole night with headlamp. Jesus Christ their master appeared and gave them instructions on where the fish was and they were able to catch so much fish that was overwhelming and was almost breaking their nets. This was done at an odd fishing time. Therefore don’t beat yourself if you don’t catch any fish. Fishing should be a fun activity. Fishing is a bit unpredictable and always treat every fishing expedition as an adventure for you and your fishing buddies. You can focus on enjoying the activity with family and friends regardless of whether you catch any fish or not.